Ryan Treacy has dedicated his life to serving as a patient advocate and a perpetual student of cannabis science. After 15 years in executive management for two national restaurant chains, he decided to pursue his passion for cannabis and start C4 Laboratories to empower people with knowledge that helps them make more informed decisions. 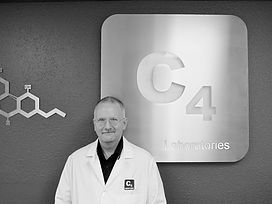 Since then, C4 has not only become one of the largest, most trusted testing facilities in Arizona, but also been at the forefront of cannabis research, education, and legislation. Under Ryan’s guidance, C4 led two research collaborations with major academic institutions and was one of the first cannabis laboratories in the country to have their findings published in a major peer-reviewed publication. Ryan is also a member of the Association of Commercial Cannabis Labs (ACCL), and is actively involved in Arizona legislation to implement mandatory testing and industry standards for label claims on all cannabis products. No matter what he’s working on, Ryan’s top priority is patients. He’s known for his honesty and ability to translate complex chemistry into understandable information that anyone can use to treat their ailments naturally. Ryan is particularly passionate about helping veterans and children. In addition to offering free consultations and product testing for seriously ill pediatric and veteran patients, he established the Med for Vets program and sponsors cannabis treatment programs for children. 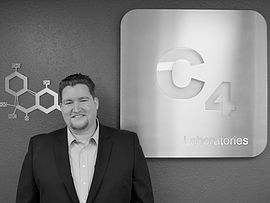 Through these philanthropic efforts, his community involvement, and daily work with C4, Ryan hopes to arm patients with the information they need to feel confident in their medicine and find the relief they need. Aaron Hicks is an analytical chemist with 32 years of horticultural experience. He brings his years in plant tissue culture, transgenic plant research, and instrumental methods in chemistry to C4 Laboratories as part of a larger effort to advance agricultural technology. In addition to his undergraduate and graduate education in chemistry and plant biology, his years of experience in research and development laboratories lend themselves to providing innovative ways to answer life's tricky questions. If pressed, he will admit to a predilection for rare and unusual plants.